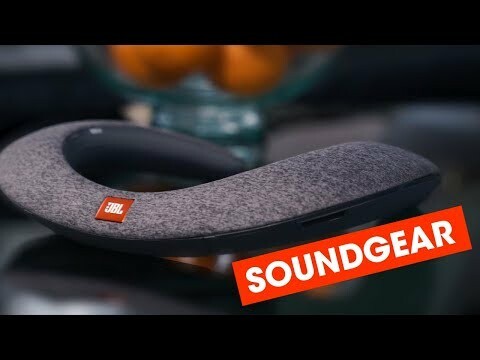 JBL SOUNDGEAR BTA is rated 3.7 out of 5 by 18. Rated 5 out of 5 by Willyt from Perfect for naps and cooking I fell asleep with this on. I laid down listening to music, asked my house AI to set a timer, then I slept. Rated 5 out of 5 by RIMA from Top!! I am the kind of person that needs constant music playing wherever I go, working on my computer, reading, driving, doing house chores, you name it. I have been looking for products like this for years. The main difference between the Soundgear and the Soundgear BTA would be the Soundgear BTA's Wireless Audio Transmitter feature which enables a convenient Bluetooth® connection to the TV to better immerse yourself in a movie.Enjoy a synchronized audio experience as a result of AptX low latency. Using either input opticalor auxiliary audio available makes your Soundgear compatible with most TVs. Rated 5 out of 5 by V0n13 from Lovely alternative to headphones I would not have traditionally thought about using wearable wireless sound collar rather than headphones/earphones however there’s are real advantages. The collar is really light and within minutes you forget you are wearing it. Really useful fworking from home, as you are able to receive your call through it so it really reduces neck strain etc. The sound quality is lively and I like to use it as I go frim room to room in the house being able to hear the music perfectly wherever I am. I real find of a product. Does the Soundgear BTA work with Xbox one and Nintendo switch as a headset/headphones. Would love to use this instead of a bulky headset to talk to friends and have better audio for gaming. Thanks. Hi. You can use the Soundgear, or any of our Bluetooth headphones, with these gaming consoles, PROVIDED they feature a line out connection, where you can connect the BTA transmitter. However, you will not be able to talk back through the system, since the BTA is one-way. That kind of use, as a gaming headset, is only possible if you can connect the Soundgear directly to the console with Bluetooth, and that us usually not possible with consoles, since they use special BT protocols. what is the difference between the soundgear and soundgear BTA? The main difference between the Soundgear and the Soundgear BTA would be the Soundgear BTA's Wireless Audio Transmitter feature which enables a convenient Bluetooth&reg; connection to the TV to better immerse yourself in a movie.Enjoy a synchronized audio experience as a result of AptX low latency. Also, the Soundgear BTA has an optical input and an aux input for you to plug it in to your devices. Hi with this soundgear if someone calls in that case his/her everyone in room can hear his/her voice or only me?? Will the microphone in this unit amplify another person speaking to me? The Soundgear BTA features the Dual mic conferencing which makes calls easy and free from echo and noise and amplifies the sound during calls. No. The two Soundgears can connect to the BTA, but not to each other. Also, when using one Soundgear, the use of aptxLL may result in a delay. If you are connected to two, the delay may be more noticeable, since LL is no longer active.